I am so excited to share this post from Tracie to you! I remember the day I clicked on the link to an article on grief that I saw in my Facebook feed. I was raw in grief, deep in the thick of the first few months of hell-on-earth, still numb with shock and disbelief. And then I saw the words, right there in the http address “crazygoodgrief.com.” I got MAD. I don’t even remember honestly what I did, maybe I clicked on the link, maybe I didn’t. Maybe I read an article or clicked on the about page and read about this woman, “Paula”, maybe I didn’t. What in the world is GOOD about GRIEF. I slammed the cover of that book, shut the door on that space, and stomped away. Nothing GOOD about it, Paula Stephens, whoever you are! But there came a day, I remember it clearly, when I decided to open the door again. I decided to get up and walk through the door of healing. I decided that I didn’t want to die in the pit of sorrow. After all, I promised my son the day he died that I wouldn’t quit living. Confession…. I used to not like you. Just kidding, well almost. I was raw at the time and hope seemed impossible. I think you get it. So anyway. I wish you weren’t so far away and we could have coffee or I could come to one of your events. Keep living and throwing life out there, even when it falls on broken hearts that don’t know how to absorb it, yet…. because eventually…. we do. And so here I am learning to heal and learning to be a healer. Reaching forward and reaching backward at the same time. Here is what I’ve learned about grief. The goodness of grief is found in the depths of love. Because without love there is no grief, and if you are grieving greatly it is because you have loved greatly. 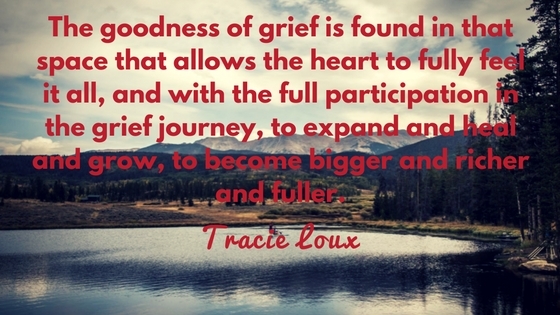 The goodness of grief is found in that space that allows the heart to fully feel it all, and with the full participation in the grief journey, to expand and heal and grow, to become bigger and richer and fuller. Yes fuller, even in the emptiness, the heart can fill. Feeling it fully allows grief to do the work of healing and changing and creating beauty out of the ashes. And yes, Grief is Crazy. The craziness of grief is found in the unpredictable wildness of it all. It is the nature of this wild beast, but it can be tamed. We are the ones who grab ahold of the wild- the wind in our face, the crash of the waves, the untamed forest trail, the river’s wild current; and get to choose what kind of adventure we will have. I for one have chosen to live outside of the cave and to step fully into this CRAZY GOOD GRIEF. And as we seek to fully grieve, I am convinced we will become whole- body, mind and spirit, moving forward into greatness, embracing healing, and rising above because of love. So allow me to invite you in to this “me too” conversation, can you see the “good” and the “crazy” in your grief? What are so ways you feel you have grown or changed?